Today one of our users reported some unusual price change after an item Turnigy Trooper SCT 4x4 1/10 Brushless Short Course Truck has been added to the shopping cart. Now our service beside buddy codes also has combo-price and promo-price. For your convenience we included filter by the discount type. Be aware that after you select just one type of the discount all the other types will be displayed too. Just in case some better price is available for this item. Today we experienced some issues with combo-prices. These issues are related to the recent changes made by HobbyKing. This option doesn’t work as it used to work before on the HobbyKing website also. Now after you add combo item to your shopping cart the price will remain regular until you add related item to you shopping cart. So now the system is checking your shopping cart and recalculates prices based on the content and if items are considered combo-items you will receive a discount. As a result we adjusted our combo-price system on the RCSearch.info. Combo prices are back! Partially. After HobbyKing changed whole procedure of handling combo-price, we were partially able to restore this option on our website. If the combo-price is available for an item the matching icon will be displayed beside the buddy-price and it looks like a magnifying glass. Once you click on this icon the list of items will be shown. 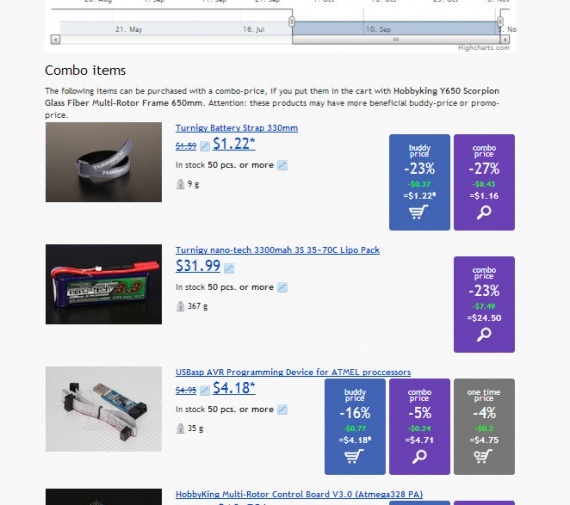 This list contains products that initial item is attached to as a combo-price item. In order to get this combo-price you must have one of the items from the combo-price list in your shopping cart. 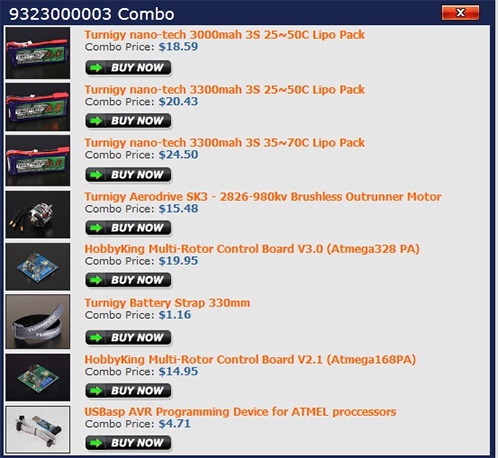 As an example for TURNIGY Plush 18amp Speed Controller combo-price list contains only one product but some products can have long combo-price lists. Let me summarize, if you want to get combo-price for an item you are browsing, you must add at least one product from the combo-price items list to your shopping cart. Please provide you feedback about this option and if you have ideas how to improve it please speak up. Most products have combo-items that can be purchased with a discount. On the RCSearch web page all the detailed information is available for the combo items such as regular price, combo price, buddy price with all the details, shipping weight, weight of the additional package and stock levels.